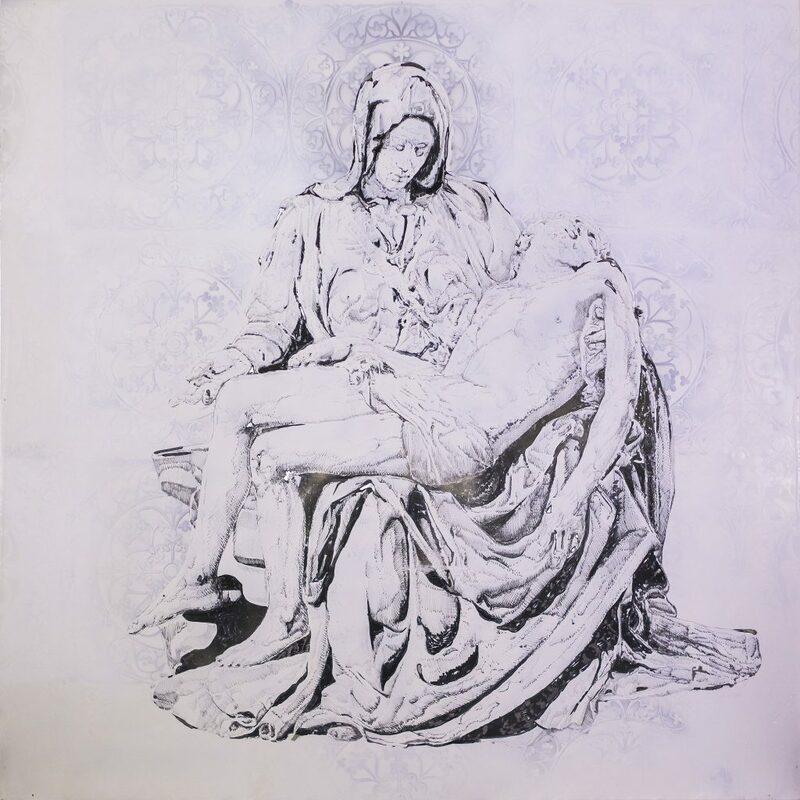 The Pieta’ represents the apotheosis of European Christian Sculpture, it embraces all the elements the renaissance brought about and precludes a sense of tradition and Christian assertiveness; all things that were true then as they are today…with one minor twist. The world changed, the face of Europe has changed, and this fabulous work is now as detached as ever from the new Europe, while remaining absolutely cemented to the old Europe. The question is….which of the two would one rather belong to? Latest political developments across the globe and colossal revivals of right wing manifestos seem to suggest that many struggle with the new and tenaciously hold on to the old. As an Artist I could not remain immune to the struggle and changes, I integrated a Seamless pattern in the background, reminiscent of traditional Islamic design, also perfected through the centuries to absolute perfection and immaculate precision, though still opposite in nature to the representational Christian approach. The idea was simple, force the two to coexist within the same plane, much like life and geo politics are trying to do with the multitude of cultures that clash on a common social ground. No supremacy and no commentary on preference, just coexistence, ever necessary.